If there’s a cheap way to make something cute and fabulous…by gosh I’m going to do it! Lol! You see my little munchkin and I...do not live in our “Forever House”…not just yet. Soooo…with our “For-Right-Now” house that I rent…I try to be as frugal with renovations as possible…because let’s be honest….it’s not mine!! I try my darnedest not to sacrifice quality or beauty when fixing this little casa up…but with a shoestring budget for renos… there’s only so much you can do! My kitchen has been an incredible eyesore for me from the beginning. What Mamma doesn’t want a new shiny kitchen?? Right?? The backsplash drove me crazy. It’s down-right depressing. I painted the cabinets and the walls…but the backsplash…had to go. This is what I started with…. Isn’t it purdy??? Mismatched floor tile backsplash. Now that’s fabulous!! This is what the area behind my stove looked like…. I have decorated this area with signs…old wood…just anything I could think of to cover this stuff. I hated it. No matter how cute anything else in my kitchen was…I could just see these uglies peering through! I wanted to update the area…without spending much. And if you’ve researched backsplash..there’s not a ton of cheap ideas. I already had Dollar Store Vinyl Floor Tiles…(the stick-on-kind) which is what was previously used as the backsplash (crazy right??? )…but I thought...well.... why not jazz up the tiles??? This is what I started with….. It actually took about 20 tiles…so there were 20 of these funny things all over my backyard! Then I had to patiently wait for the tiles to dry. And wouldn’t you know that a storm rolled in …so I had to gather ALL of the them and put them inside to finish drying! Oh my! It wouldn’t be a Tiffany project if something didn’t GO WRONG! Before I put up the new tiles I removed a few old ones that were peeling off. Little did I know what a darn project that would turn into! The whole thing came off…and this is what it looked like!!! GULP!!! I took a deep breath and carried on. There was no backing up or giving up now!!! And thank goodness I didn’t give up because IT’S SOOOOO MUCH BETTER NOW! Aaahhhh…it just looks fresher…cleaner…better. I’m in such a happier mood every morning when I see it. I do think that you could take it a few steps further and maybe add some decorative stenciling…making it appear like pressed tin tiles. I am impatient and wanted it “fixed” right now…maybe later I will try to see how stenciling works out. This project proves that just because you are renting…and may not have a huge budget for renovations…you can be creative and find a cute way to make it pretty with what you have! Easie Peasie!!! I am entering this little reno project into the CSI Dollar Store themed competition! I was so excited to see it as the theme for this week! Perfect timing to show off my new Dollar Store Backsplash! 1. I won the C.S.I. contest!! Yipeeeeeeeeeeeeeeeeeeeeee! View the POST by clicking HERE! 2. I've had a lot of questions about the durability of the tiles. So far they are perfect. No chips, peels or flaking. In addition to using a primer, I did coat the tiles in a clear gloss after painting. I think you could also use a spray or wipe-on poly to seal the paint as well?? Maybe?? Here are RECENT pictures of my back splash and kitchen. The tiles are still holding up FABULOUS...and LOOK GREAT!! I have yet to have any problems!! I also NEVER leave things the same way...paint color...furniture...accessories. Are you kidding me?? Peel and stick?? It looks like fantastic!! Hmmm. W ejust redid our kitchen and have the backsplash left to do. Wonder if I can convince the hubs to do this! Found you from the CSI blog! What a great idea! It looks 1000 times better than the old one!! Good job! It turned out so pretty! What a huge improvement...love the result! Your backsplash came out great. It added such a nice touch to the room. Wow, the silver looks so elegant - amazing transformation! $20 backsplash???? You should win the CSI this week! 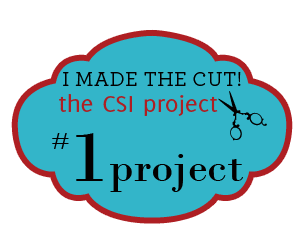 You got the #1 project at the CSI challenge! Congratulations! This is AWESOME!!! Congrats on getting #1!! Congratulations on being the #1 Project in the $Store Challenge! You did an amazing thing to your kitchen! Thanks so much everyone for your sweet comments! You all are the best!! Might have to steal this awesome idea!! I'm wondering about different paint treatments. Great project! It's such an improvement over the old backsplash. Stopping by from the Lady Bloggers Society Tea Party to say hi! Looks great, my mind is spinning with possibilities, my biggest question, how durable is this? You have this in the kitchen, near the sink and over the stove, I believe the tiles themselves would hold up, but what about the paint treatment you did to them? Is it washable? Scrubbable? Did you do anything to seal the painted surface? You did a really awesome job! It looks really nice! Okay, that was just genius, seriously. You totally deserved to win CSI and I may have to copy this idea. Awesome! Just love the look as is :) It sure does make your kitchen shine! I'm not a renter but I think I might try this because someday I will create my dream kitchen in the home we have but until I can afford that it could use a little makeover! Thank you! Big transformation on a tiny budget. I'm very impressed! Great job! Your kitchen looks like it is from one of those decorator magazines! Bravo! kitchen looks very awesome. Thanks for sharing. My kitchen looks eerily similar to yours except my back splash is fine, plain white tiles, it's my counter tops that look hideous. They are an ugly red Formica from the 50's with the silver rim all the way around. I also rent & for 3 years I have been trying to find a way to hide them. them. I removed all paint down to the bare and beautiful original wood gave them a light staining and polyurethene coating. THEN came the counter tops old, dingy, and full of knife cuts so I sanded them down a little and headed to dollar general where I picked up three rolls of green marbled contact paper after finishing I had a completely new kitchen and anyone that come over(including my landlord) thought I had bought new marble counter tops. The contact paper still looked brand new 3 years later when I moved out. Beautiful job! I'm googling around looking for "inexpensive diy backsplash," and your post came up. I took a sad, broken cabinet down in my kitchen, and the wall is a mess behind it. This solution might work for me, too, as I already have all those supplies. As an artist who has done silverleafing, it intrigued me that you used red as a primer. Traditionally a red color is used as a ground in silverleafing. It looks great. I am looking into redoing my backsplash (that was never there) and our landlord just gave us the go ahead and is even deducting it from our rent which is awesome. Anyway is it easy to clean since it is now painted? I need something that is easily wiped down without ruining it. So I did try this idea, but a lot of my tiles are not sticking to the wall! Do you have any suggestions? I tried hot glue and new tiles, but still I get falling tiles in the same places.